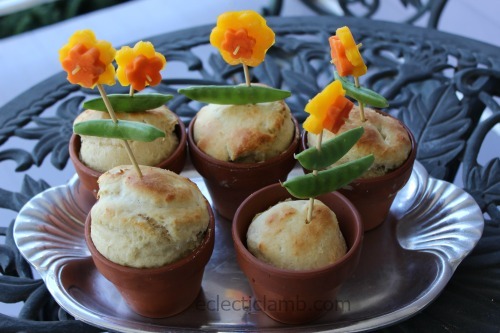 My nephew and I made these flower pot breads with vegetable flowers and ate them as part of our dinner. I used this bread recipe. The flowers are bell pepper and carrots cut with flower cookie cutters. The flowers are held together with raw spaghetti and put on wooden skewers. Last year we used the same pots to make cupcakes. So cute! The flowers are so pretty. Did you have to block the hole in the bottom of the flower pots? Thank you! They were pots made special for baking and did not have a hole in the bottom. Oh! We have a no bake Russian Cheesecake recipe that you make in a flower pot. We line the pot with cheesecloth first so it doesn’t go out the bottom! Where did you find the little pots? My Grandmother gave them to me as a gift over 20 years ago!